After a busy few weeks of League and Cup action, it’s timefor an update from the men’s camp on the new faces in the squad and on ourinjury situation. Regular fans will have seen a number of new players in theteam over the past few weeks, as Darren Freeman attempted to plug the holesleft by injuries and suspensions. As Darren explains: “We have a lot of trialists in at the club,who we don’t mention. We get a lot of CVs, we go through a lot of video footage,and then we decide which players we want to come and train with us. It’s on the strength of such trials and recommendations thatyou’ve seen players such as midfielders Dan Darbyshire, Wilson Chingoka and RamoneCassidy-Sinclair in the team over the past few weeks. Each of those players impressedDarren enough in training to earn first-team berths, with former QPR player Darbyshirebecoming a regular face in the first XI since making his debut at KingsLangley. It’s the centre-back position that has seen the most changesin recent weeks, with Frankie Chappell seemingly playing alongside a newpartner in every game. With Stacey Freeman away with work commitments, LloydCotton suffering an illness and Alex Malins still finding his way back from along-term ankle injury, Darren has again been forced to find new faces. Alas, Tom was cup-tied for Saturday’s trip to Bath, leadingDarren to sign on Joe Russell as cover. “Joe’s been on trial with us and donewell, and I thought he did well when he stepped in on Saturday,” the gaffersaid. So what of that injury list as long as one of Ross Standen’sarms? Well, things are looking up. Lloyd Cotton is on the mend after his illness and should berejoining training this week, while fellow centre-back Stacey Freeman is backfrom his work commitments abroad. Still, Darren won’t have his full squad to pick from at theweekend – although for the best possible reason. Jonte Smith is once again withBermuda, having scored against Aruba for his country last month. The injuries and absentees have also given our young playersa taste of life in the first team squad. 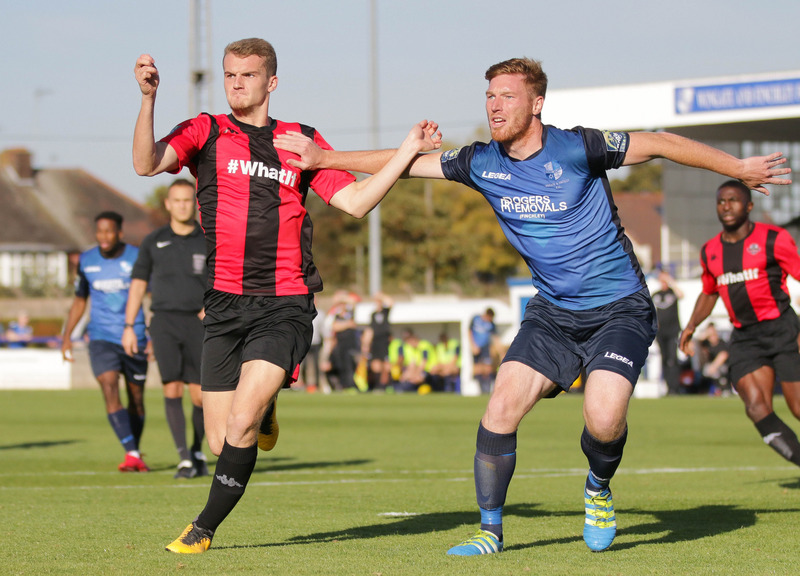 Sam Karl played the full 90 minutes againstKings Langley at the Dripping Pan, while under-18s players such as Dylan Gifford,Ross Barclay, Alfie Headland and Harrison Parker have all been in the squad forgames over the past few weeks. Still, Darren won’t rush the boys into the first team, giventhe physical demands of the Bostik Premier. “The physicality of the oppositionis a big difference compared to the Bositk South,” said Darren.